Do you love Florence? Are you interested in football? If so have you visited the football museum located at Coverciano in that city? It’s where the Italian Football Association has its headquarters, its training centre and where Pier Luigi Nervi’s architectural masterpiece is located – the first reinforced concrete football stadium ever built, dating from 1931 and where, besides memorable matches, such immortal singers as David Bowie also have given concerts. Italy boasts a proud history of the beautiful game and has been world champion no less than four times: in 1934, 1938, 1982 and 2006. ‘Gli Azzurri’ (or ‘light blues’ as they are called from the colour of their football jersey) are truly this country’s pride and joy and fully deserve this very well laid-out museum with helpful staff and an excellent archive. The Museo Del Calcio, which I finally visited last week, is laid out in a historical sequence, starting from the late nineteenth century when athletic clubs used football to develop their members’ skills. The origin of football teams from these clubs is also apparent in the UK in such names as Charlton Athletic, our local south London team which was a firm favourite of the great Italian writer Italo Svevo (‘The Confessions of Zeno’) when he was managing a paint factory near the college where I taught for a quarter of a century. 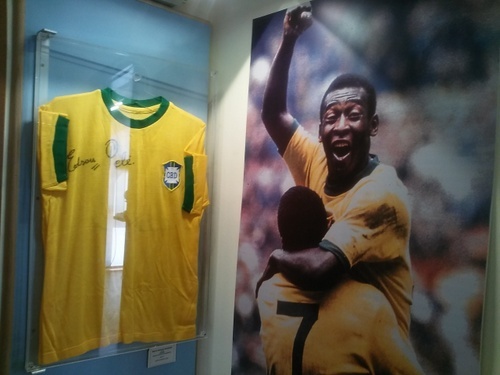 It’s so fascinating to follow the history of the Italian national football team and also to gaze in wonder at the jerseys of such greats as Pelé and Maradona. It’s equally sad, too, to follow the tragedies of Italy’s magnificent international team: for example, the Superga disaster of May 1949 when an aircraft carrying the ‘Grande Torino’ football team, which included most of the country’s international players, crashed in thick fog on the side of the Superga hill near Turin killing thirty one persons, including the great Valentino Mazzola. Although the modern history of football stems from England don’t forget that the game actually originated in Italy in mediaeval times. 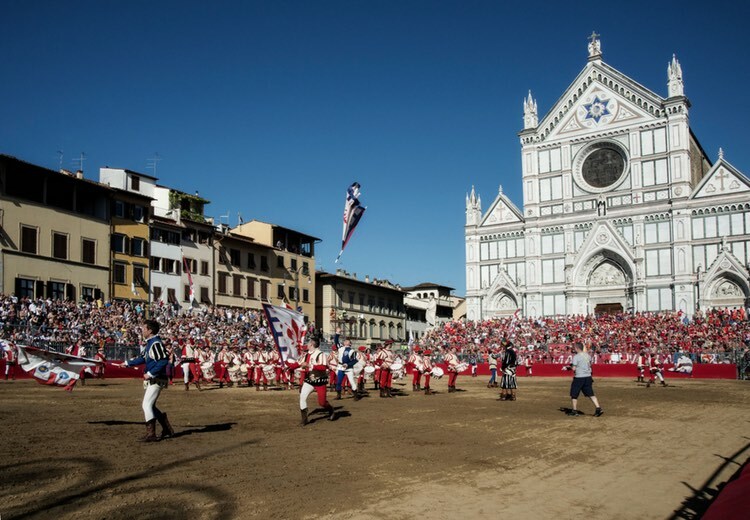 The official rules of the ‘Calcio Storico Fiorentino’ – a heady mixture of football, rugby and wrestling – were first laid down in 1580 by Giovanni de’ Bardi, a Florentine count. This fact is remembered in Florence’s annual traditional ‘Calcio Fiorentino in costume’ which is played on June 24th on Florence’s feast day for its patron saint, St. John the Baptist. Four teams fight it out for the grand finale: Santa Croce Santo Spirito, Santa Maria Novella and San Giovanni. It’s also a great occasion for putting on one of the city’s most spectacular historical pageants. Whether it’s the modern game you’re interested in (and especially if you’re a supporter of ‘Fiorentina’ la viola, Florence’s own football team – at present happily eighth in serie A – or whether you like to revel in the Calcio storico Fiorentino played out in the square before Santa Croce church your Florentine experience would certainly not be complete if you haven’t been present at one of the two versions of this emperor of all sports. Il Cavallino Bianco – best in Benabbio for grown-ups. Ristorante Villa Aurora: excellent spot if it’s open. We chose none of these places – not because we didn’t agree with the suggestions (Buca di Baldabò and Biribisso have been the top contenders for the best eating places in Val di Lima for some time now.) but because we just didn’t happen to be there at the time of the kick-off. 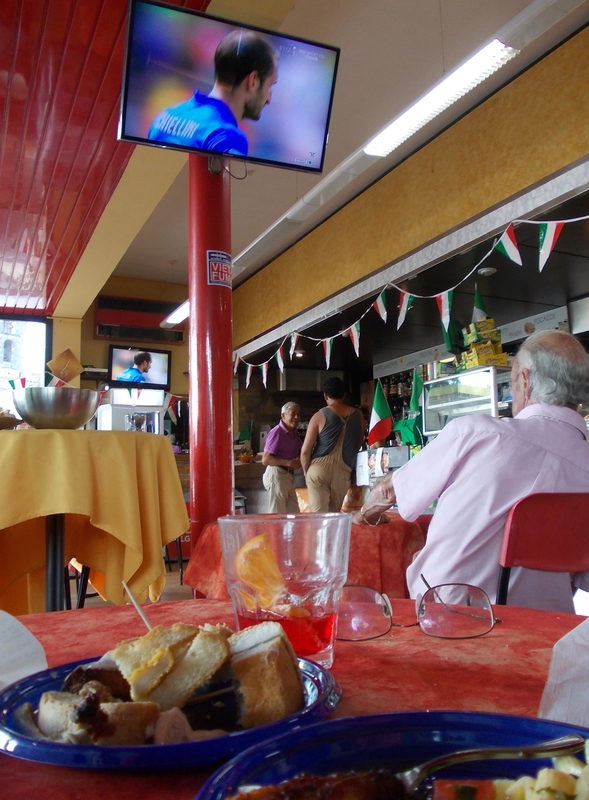 We witnessed England’s demise in the comfort of our home and yesterday Italy’s expiration was watched at the AGIP service station at Chiffenti where a small, but select, group gathered around the two sets and watched in increasing dejection while they were well fed free-of-charge with excellent hors d’oeuvre, including chicken wings and pasta, while imbibing a moderate degree of alcohol. Yes, it was definitely a match that requires further investigation. Marchisio was shown a red card and sent off without any valid reason that I (or anyone) could see. 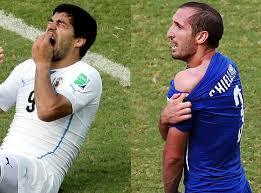 And Suarez complaining about toothache after biting Chiellini’s shoulder (the third time he has been involved in such an incident) was really the last straw in a match which was played with constant irritation and frequent frustration, particularly on the Italian side. If only the Italian play of the last few minutes of the second half and the extra time – when Prandelli’s team showed what they could do with sustained attack, wave after wave, in a desperate last-ditch attermpt to get that equalizing goal which would have kept them going into the next round – had been attempted at the beginning of the match! Even that unpredictably genial Italian foster-kid, Balotelli, was not up to scratch and was replaced in the second half. Despite their well-thought-out 3-5-2 formation, the Azzurri (light blues –actually the Italians were wearing a rather deeper blue kit) showed a disappointing lack of confidence – something which Prandelli sensed deeply and blamed on himself when he proffered his resignation as Italy’s national coach after the match. What a difference I thought to myself from 2006 when the life of Italians, victors of the world cup, moved forward into broad, sunlit uplands and when the Italy I had lived in just one year was a nation full of economic, political and social confidence. (Indeed, my neighbour had painted his old Punto in the colours of the tricolour flag). At that time I was in London, watched the match on the large screen in the Italian institute in Belgrave square and, after the glorious victory against France which got Italy their fourth World Cup win (even though the final score had to be decided with that so-unsatisfactory compromise: the penalty shoot-out), we marched triumphantly to occupy Trafalgar square and cool off in the fountains, watched over by Landseer’s Lions. The pictures of that wonderful year for Italy are still to be seen in Doctor Enrico Castellacci’s surgery in Lucca which I attended a few years back when shoulder arthritis had made sleeping a tedious occupation for me. Now, the disappointment for Italy may give me at least one further sleepless night. Ah well – it’s only a game of football!